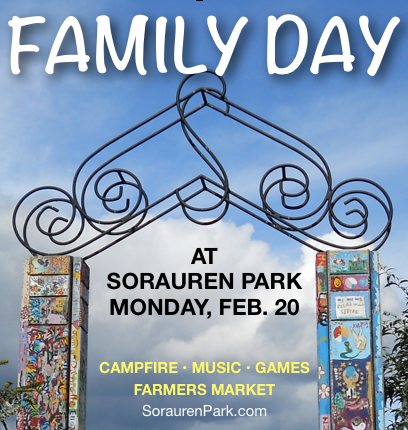 You’re invited to the park on Family Day Monday for a campfire and special activities organized by the Friends of Sorauren Park and the Sorauren Farmers Market. With the demise of the rink over the warm weekend, the focus will shift to the Town Square, with all-welcome drop-in ball hockey and the campfire, beginning at 1 p.m. Bring your sticks, we’ll set up the nets. Sound system courtesy Scooter Girl Toys. The Farmers Market gets under way at 3 p.m., with special giant jenga, corn hole games and hot drinks. Fabulous market delicacies and prepared food will be available at the Market tables in the Sorauren Fieldhouse until 7 p.m. 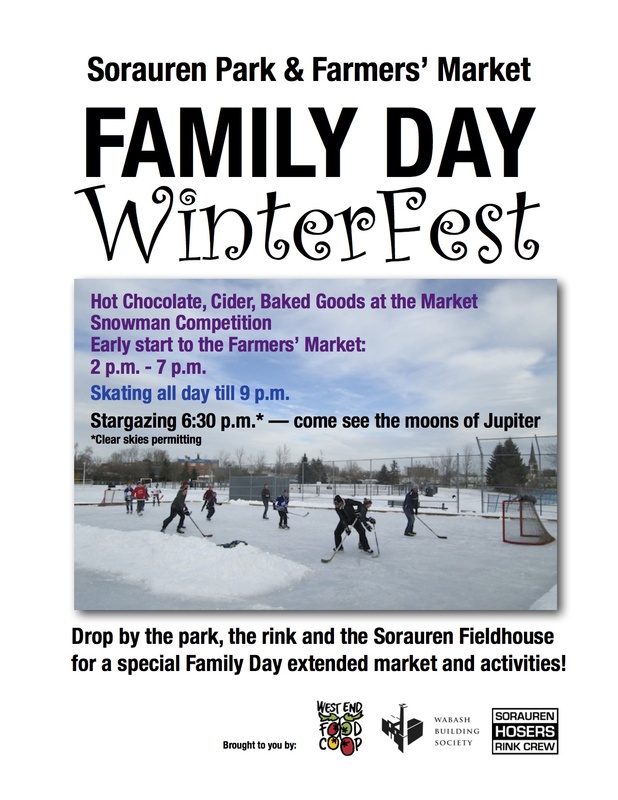 Spend your Family Day in the community with a swing by Sorauren Park. The weather is looking promising for a great day of skating and shinny on the natural ice rinks, brought to you by the Sorauren Park Hosers. Then, the Sorauren Farmers Market will start early at 2 p.m., with tunes, hot chocolate, treats and goodies, running till 7 p.m. in the Fieldhouse by the rink. If the skies are clear, Sorauren Stargazers will set up the telescope for early-evening views of Jupiter, its four biggest moons, the Orion nebula, and other heavenly sights. Bring your own fun things to do, too! See you at the park on Feb. 16. 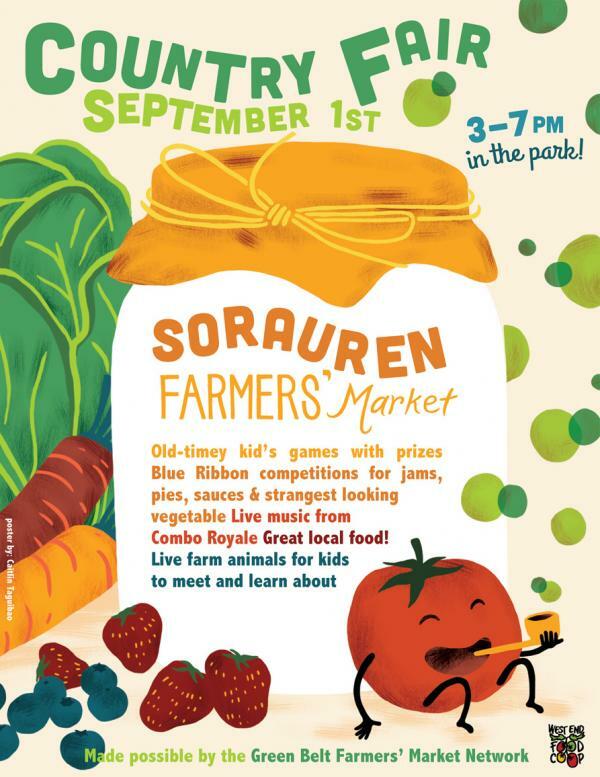 Labour Day Sept. 1 features a special version of the Sorauren Farmers’ Market: the Country Fair, with live farm animals, old-timey kids’ games, Blue Ribbon competitions, strange vegetables, and great food and live music. The market runs from 3 to 7 p.m.
Make sure to end your long weekend with a visit to the Sorauren Farmers’ Market and the new Sorauren Town Square. Check out the new trees and watch the Adopt-A-Tree waterers in action. Every new tree in the square is now labelled with species and adopters’ names. Special thanks to Pollocks Home Hardware on Roncy for the hoses and Addison Inc. plumbing on Wabash Avenue for help with the tree labels. Aren’t our local businesses awesome?! 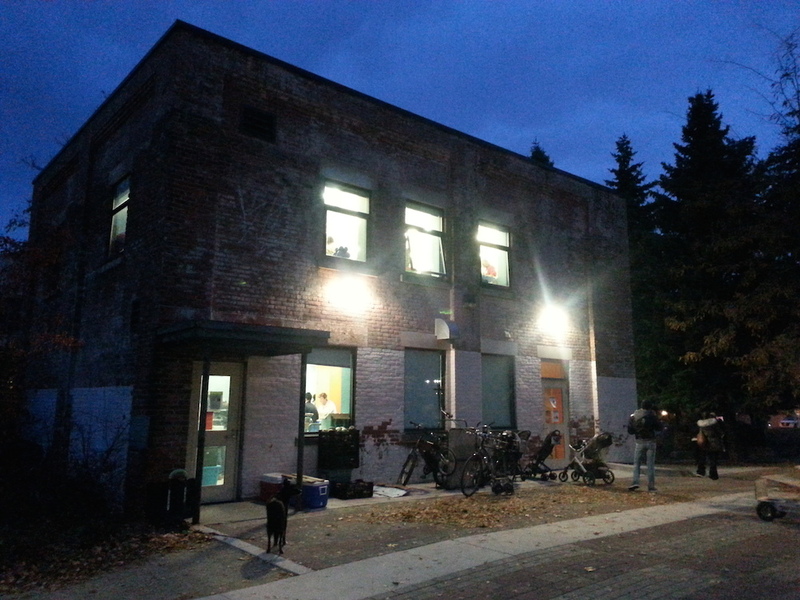 The Sorauren Farmers’ Market is produced by the West End Food Co-op and made possible by the Green Belt Farmers’ Market Network. Liking the new Town Square but wish it had benches? 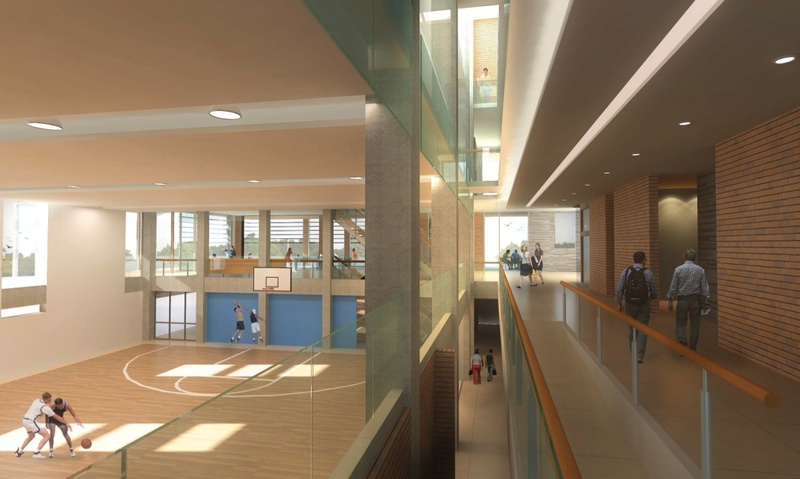 Donate to the Phase 2 Town Square fundraising campaign! We’ll be installing benches, a bake oven, more bike rings, and an iconic trellis with your support. Donations of $100 or more will be recognized on the new Phase 2 Donor Wall and a permanent donor wall to be erected once the trellis is built. Makes a great gift! All donations over $10 receive a tax receipt thanks to our collaboration with the charitable Toronto Parks and Trees Foundation. Game on! Sorauren Park soccer and baseball has kicked off another season… games are played every weekday evening and Saturdays. Watch for lots of kids coming to and from the park around and after dinner-time especially. The Farmers Market moves outdoors on Monday, May 19. Remember, the market is every Monday from 3 – 7 p.m. Watch for news about Ontario wine sales, coming to the market soon! UPDATE: Ontario wine sales start this Monday May 19! 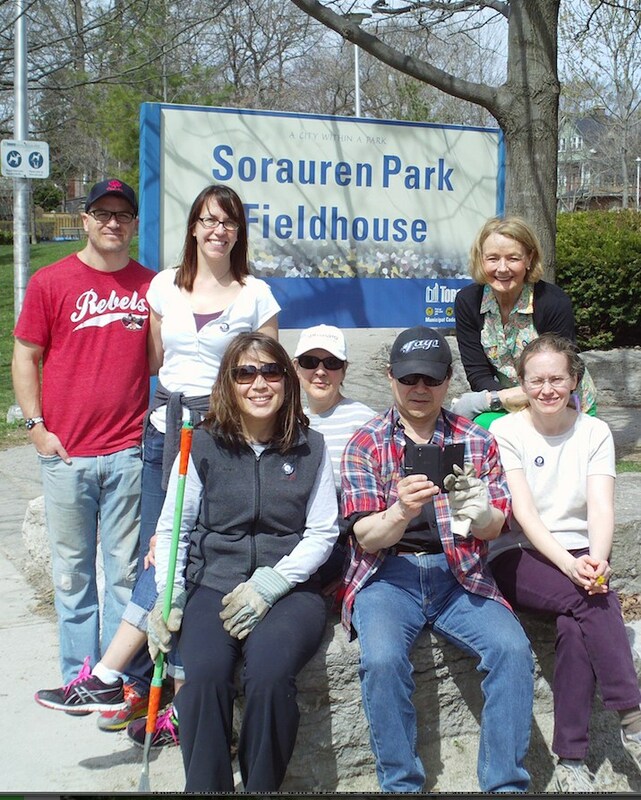 Thanks to Sorauren gardeners, Yale alumni on the Yale Global Day of Action, and MP Peggy Nash (photo above) for once again tending to the gardens around the Fieldhouse. Looking good for the upcoming opening of Phase 1 of the NEW Sorauren Town Square! Speaking of which… mark your calendars for Monday, June 23, 6 p.m., for the official opening of the Town Square. The community is invited to help tear down a ceremonial fence to open the Square (we’ll have a long rope everyone can grab onto). More details to come! Thanks to Larissa Mattwich for the wonderful painting of skaters at Sorauren Park. 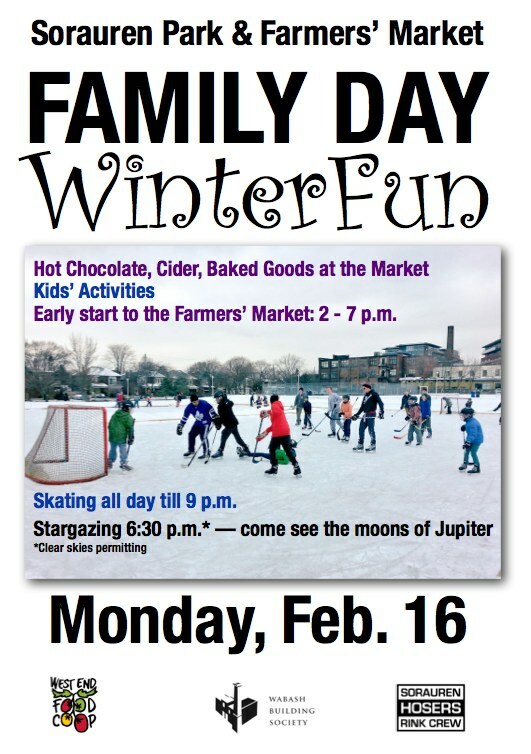 Family Day promises to be special at Sorauren Park this Monday, Feb. 17! The Sorauren natural ice rinks — with pads for all-ages shinny and pleasure skating — have enjoyed an awesome year and will be ready for fab fun. The Sorauren Farmers’ Market will open an hour early, at 2 p.m., on Monday in the Fieldhouse, with hot chocolate, baked goods, activities for kids and many other special treats! Participate in the snowman competition! If the skies are clear, at 6:30 p.m. the Sorauren Stargazers will set up the telescope to have a look at the moons of Jupiter… the gas-giant planet has been blazing brightly in the eastern and southern skies all winter.